Arlo the Pug: This one's for you. Just a little pug in a big world. It is with tears in our eyes that we mourn the loss of Hank. All of or blog friends are special and I look forward to reading about each and every one of you, but Hank was special because he was the only one of our Blog friends that we've ever met in real life. Meeting Hank and Sarah was great. It was the first time that I had hever done anything like that But Hank was soo adorable and Sarah was soo nice, it was so much fun. Sarah and Hank Gave arlo and me an adorable heart magnet. Every time I look at it I think of him. Now that Arlo's officially "21" we will be raising our PBR's up high in memory of one great dog who never had to doubt how much he was loved. This is a loving tribute Arlo! Awwww, Arlo. This is so touching. Our "midwest tour" was a defining moment for Hank and me, and I'm glad you and your mom (and grandma!) were a part of it. 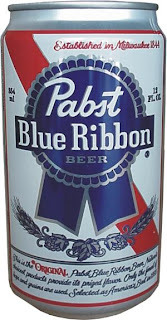 The PBR, cookies, and your hospitality will always be remembered! Hi! I'm Arlo! Nice to meet ya!